Max Roach, the master percussionist whose rhythmic innovations and improvisations defined bebop jazz during a wide-ranging career where he collaborated with artists from Duke Ellington to rapper Fab Five Freddy, has died after a long illness. He was 83. The self-taught musical prodigy died Wednesday night at an undisclosed hospital in Manhattan, said Cem Kurosman, spokesman for Blue Note Records, one of Roach's labels. No additional details were available, he said Thursday. Roach received his first musical break at age 16, filling in for three nights in 1940 when Ellington's drummer fell ill. Roach's performance led him to the legendary Minton's Playhouse in Harlem, where he joined luminaries Charlie Parker and Dizzy Gillespie in the burgeoning bebop movement. In 1944, Roach joined Gillespie and Coleman Hawkins in one of the first bebop recording sessions. What distinguished Roach from other drummers were his fast hands and ability to simultaneously maintain several rhythms. By layering different beats and varying the meter, Roach pushed jazz beyond the boundaries of standard 4/4 time. His dislocated beats helped define bebop. Roach's innovative use of cymbals for melodic lines, and tom-toms and bass drums for accents, helped elevate the percussionist from mere timekeeper to featured performer -- on a par with the trumpeter and saxophonist. "One of the grand masters of our music," Gillespie once observed. In a 1988 essay in The New York Times, Wynton Marsalis wrote of Roach: "All great instrumentalists have a superior quality of sound, and his is one of the marvels of contemporary music. ... The roundness and nobility of sound on the drums and the clarity and precision of the cymbals distinguishes Max Roach as a peerless master." Throughout the jazz upheaval of the 1940s and '50s, Roach played bebop with the Charlie Parker Quintet and cool bop with the Miles Davis Capitol Orchestra. He joined trumpeter Clifford Brown in playing hard bop, a jazz form that maintained bebop's rhythmic drive while incorporating the blues and gospel. In 1952, Roach and bassist-composer Charles Mingus founded Debut Records. Among the short-lived label's releases was a famed 1953 Toronto performance in Massey Hall, featuring Roach, Mingus, Parker, Gillespie and pianist Bud Powell. But by the mid-1950s, Roach had watched several of his friends -- including Parker -- die from heroin addiction. In 1956, Roach was further devastated when Brown died in a car accident. After his own struggle with drugs and alcohol, Roach rebounded with the help of his first wife, singer Abbey Lincoln. Married in 1962, they divorced eight years later. Roach re-emerged in the 1960s free jazz era with a new political consciousness. Albums like "We Insist! Max Roach's Freedom Now Suite" reflected his support of black activism. Over the next decades, Roach expanded his repertoire and explored new challenges. He taught at the University of Massachusetts, traveled to Ghana in search of new music, and performed with groups from Japan and Cuba. He also formed an all-percussion ensemble known as M'Boom, a quartet and a double quartet that included Roach's daughter Maxine Roach on viola. Roach even worked with rapper Fab Five Freddy in the early 1980s. Ignoring critics, Roach insisted rap had a place on music's "boundless palette." Roach, who in 1988 became the first jazz musician to receive a MacArthur Fellowship "genius award," said his curiosity reflected his sense of obligation to music. He was inducted into the Grammy Hall of Fame in 1995. 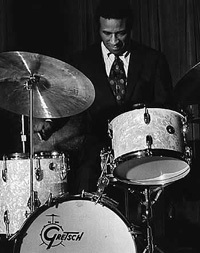 Max Roach was born in New Land, N.C., on Jan. 10, 1924. His family moved four years later to a Brooklyn apartment, where a player piano left by the previous tenants gave Roach his musical introduction. Using player piano rolls of Jelly Roll Morton and Albert Ammons, Roach played along by putting his fingers on the keys and pedals as they rose and fell. But he was looking for another instrument to play when he began singing with the children's choir at the Concord Baptist Church. Roach found a snare drum, and was hooked. His father gave the eighth-grader his first set of drums, and Roach was drumming professionally while still in high school. He was survived by five children: sons Daryl and Raoul, and daughters Maxine, Ayl and Dara.